songbirds have already nested and many of the young have fledged, some songbirds like Bluebirds, Robins and Cardinals who may have three broods during the season, and Mourning Doves who may have as many as six, may be working on another nest and raising another family. 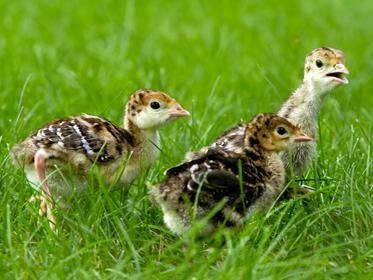 And if you live in an area with Wild Turkeys, this is the time of year to see them out and about with their families. 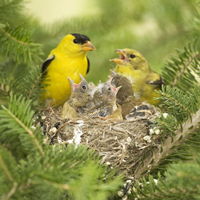 American Goldfinches are right in the midst of their nesting season in mid-summer. They wait to raise their chicks when they can be assured of enough food for them, so when thistles are ripe, you can expect to start seeing goldfinches hanging from them extracting the seeds for their brood. Want to attract birds to your backyard throughout the nesting season , including late nesting birds? Try these ideas! Food is the biggest attraction as these birds have a lot of mouths to feed and some of them are needing specific food which is available only this time of year. If you are planting native plants, make sure you have lots of late bloomers and seed producers including thistles, goldenrod, sunflowers and some asters. Milkweed and Goldenrod should be staples in your garden as they attract a lot of insects, butterflies and birds. Plus the Milkweed offers fluffy nesting materials which goldfinches love. Make sure your backyard is safe for baby birds. Keep cats indoors as many baby birds will spend several days on the ground right after they leave the nest and are extremely vulnerable to predators. Also, keep your brush pile and low shrubs going so fledglings have a spot to hide. Keep clean fresh water available at all times. During the hottest days when these birds are nesting, they very much need the hydration and the ability to stay clean and cool. Some birds will nest into September, so if you create a safe environment with the essentials they need, you may be seeing baby birds in your backyard for a few more months.